Canadian Ambassador Ian Burney has long felt an affinity with Japan both professionally and personally. 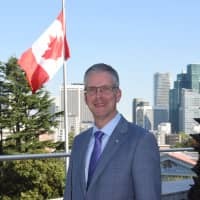 Prior to taking on his current role two years ago, the trade specialist had been visiting Japan on a regular basis to represent Canadian interests in international negotiations. His personal connection with Japan, however, dates back to very early childhood, when his family resided in Tokyo during a posting for his diplomat father. “This assignment is a bit like coming full circle for me. I was here from the ages of 1 to 8, while my dad was on his first diplomatic posting for Canada, and so I grew up here. Eating Japanese food, watching Japanese TV and my first sport was baseball, not ice hockey,” Burney said with a grin. With his professional background and interest in international trade, Burney was delighted to have the opportunity to serve his country as ambassador to Japan, noting that the timing worked out well for his family, too. His wife has been able to maintain her career and telecommutes in her role as a senior government lawyer. The first Japanese diplomatic mission in Canada opened in Ottawa in 1928, followed by the establishment of Canada’s first Japanese diplomatic mission the following year in Tokyo — the embassy will celebrate its 90th anniversary next year. Burney shared an amusing piece of trivia on how Herbert Marler, Canada’s first diplomatic representative in Japan, acquired the land the embassy still sits on shortly after arriving in 1929. “Rumor has it that the property was haunted and so Marler got the spot for a great price,” he said. The complex continues to draw frequent praise from visitors for its stylish design and spacious surroundings; last year the embassy hosted around 600 events and over 40,000 visitors. Upon becoming Canada’s newest prime minister in 2015, Justin Trudeau also appointed himself as minister of youth, sending a clear message that young people matter. Echoing this sentiment, Burney believes that exchanges between Canadian and Japanese youth have immense potential. In terms of youth exchange, young Canadians make up the second-largest contingent among Japan Exchange and Teaching (JET) Programme participants, coming to work as assistant language teachers and international relations coordinators. According to Burney, they can serve as “de facto ambassadors” through their interactions with Japanese people, and the embassy seeks to support Canadian JETs as much as possible during their time in Japan. This includes a briefing session at the embassy at the start of their assignments, as well as ongoing support, such as providing materials for lesson plans and talks about Canada during the course of their JET Programme activities. On the flip side, Canada is a popular destination among young Japanese for working holidays and study abroad. On Nov. 2 and 3, the Fall 2018 EduCanada Fair will be held at the embassy, catering to students of various ages and levels, from summer school through postsecondary education. The fair will move on to the Umeda Center Building in Osaka on Nov. 4. Amid a background of global, political and social change, Burney noted there has been pleasing progress in economic and trade relations between Japan and Canada, such as the signing of the Comprehensive and Progressive Agreement for Trans-Pacific Partnership (CPTPP) in March this year. When the U.S. withdrew from the now-defunct Trans-Pacific Partnership last year, the remaining 11 nations decided to move forward with a new agreement, resulting in the ratification of the CPTPP. “This is a watershed in Japan-Canada relations. We have been trying for more than 10 years to have a bilateral trade agreement with Japan like this. It is also an important signal to the rest of the world that these 11 countries are committed to free trade,” Burney said. “At a time in the world when such values are under threat, both Japan and Canada prioritize democracy, human rights, the environment and respect for open markets and free trade. We have made this the centerpiece of our economic policy and we are viewing our relationship with Japan through this lens,” he said. Looking ahead, Burney is committed to strengthening Canada-Japan relations across the board while proactively seeking new opportunities for mutual cooperation and sharing of best practices. One example is increasing global concern over marine pollution from plastic, an issue Canada pushed during its Group of Seven presidency that Japan will continue spotlighting at the Group of 20 summit. “We are both maritime nations and we are pleased to have played a role in bringing attention to the problem, and we will continue to work with Japan on this,” he said. Ian Burney earned a bachelor’s with honors in political science from McGill University, followed by an M.A. in international relations from the University of Toronto. 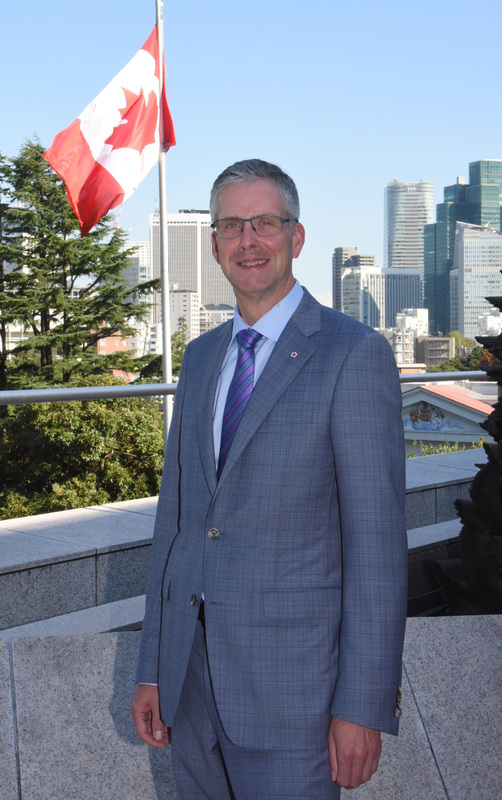 Since joining Canada’s then-Department of External Affairs in 1987, he has held a variety of positions both domestically and abroad, including roles at the Canadian Embassy in Bangkok and at the Consulate General of Canada in Ho Chi Minh City. He has also frequently participated in international trade negotiations with the United States and Asia-Pacific nations. Prior to his current assignment in Japan, he was appointed assistant secretary of the Cabinet in the Privy Council Office’s Economic and Regional Development Policy Secretariat in July 2015. He also received the 2014 Outstanding Achievement Award of the Public Service of Canada, the highest recognition for senior leaders in public service.